Featuring a superb level of comfort both for rider and passenger, thanks to the comfort seats with 3D mesh technology, and enhanced wind protection, courtesy of the adjustable windshield and hand guards, the new Tiger XRx will tempt you into embarking on an exciting trip. The standard cruise control enhances your riding pleasure over long distances, while the advanced trip computer displays all the information of your journey. The second power socket and center stand add another level of practicality. TRIPLE ENGINE: Delivering a seamless flow of torque across the rev range, the Tiger 800 is as perfectly suited to long-distance rides as it is to tackling the tough stuff. The second generation 800cc engine now features a ride-by-wire throttle system which provides smoother power delivery , better response and lower emissions. FUEL EFFICIENCY: The new Tiger 800 has a 17% improvement in fuel efficiency that, coupled with the capacious 19L fuel tank, means you can ride longer. GEAR BOX: The gearbox selector mechanism is derived directly from the class leading Daytona, for quicker smoother shifts. TRIP COMPUTER: The LCD screen displays time, ambient temperature, fuel gauge, gear indicator, odometer and journey distance.The Tiger 800 XRx and XCx models add more functionality with extended information including: journey time, average speed, average fuel consumption, range to empty and instantaneous fuel consumption. ELECTRIC RIDING MODES: Switch from road to off-road to rider programmable modes on the fly - and overcome the weather, the road and whatever nature can throw at you. The Tiger 800 range offers three different Riding Modes that allow the adjustment of the throttle maps, ABS and TTC to suit different road conditions. 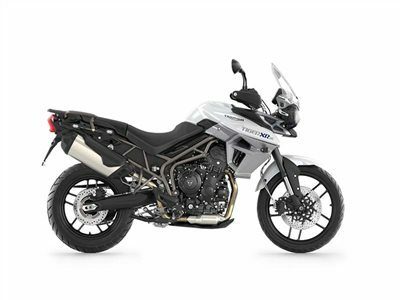 Select either ROAD or OFF-ROAD mode and the throttle maps, ABS, and Triumph Traction Control are automatically set. RIDER MODE allows you to configure these settings independently to suit your own personal riding style. In RIDER MODE, the throttle maps can be switched between RAIN, ROAD, SPORT, and OFF-ROAD settings. CONTROLS: The Tiger 800 models feature Cruise Control as standard, making long journeys more comfortable and helping fuel efficiency.